Who was Al Demaree? Why does his name appear first, like some kind of superstar insert? And if he proved successful for years as pro ballplayer and sports artist, why did he die penniless? Just the name of former pitcher Albert Wentworth Demaree evokes gentility, a character from F. Scott Fitzgerald dabbling on the mound between fox hunts. Perhaps a vintage version of Michael Jordan, stepping away from dominance in one arena to try his luck with another. In a sense, that's correct: Al's skills with horsehide paralleled similar art talents with a brush, a sports profession he ultimately extended far beyond his 8 years as a serviceable pitcher (career stats). Demaree gets top billing for this set because his cartooning skills supplied the bodies for its unusual stand-up "cards." Black-and-white photo busts top Al's hand-drawn bodies and collectors would fold the curved base of each player's cut-out in two places to form a vertical stand-up about 4" tall. Ernie Orsatti's card (borrowed from R304's OldCardboard.com profile) shows those horizontal fold lines more clearly. Player names and origin appear below the fold lines; a close look at #5's base shows Al's handwritten Samuel Dewey (Sam) Byrd and Born Breham, GA.
Each team in this set got a starting roster of 9 fielders + 1 pitcher for 10 cards total. Multiply that team total by 16 franchises, plus 4 umpires each for AL/NL, and you reach the estimated checklist of 168. Modern catalogs guess at the set's exact composition because no one's seen all 168 players with their numbered tabs. A collection discovered in 2010 added 30 new entries to the "known" list, but question marks remain on the best version I've seen (also at OldCardboard.com). It's believed the Dietz Gum Co. of Chicago packaged these cards in 1934-35 with "Ball Players In Action" chewing gum. Amass enough cards and you could play a board game with full defense and league umpires officiating. 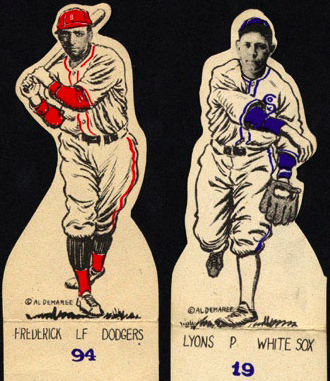 Gum vendors could trade the game board for 10 wrappers, a similar promotion to the 1933-36 Goudey Premiums. Without player stats or known instructions, though, it's anyone's best guess how such a game would be played and I've never seen the board itself. 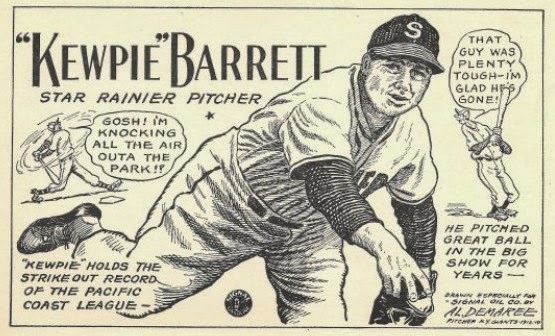 Demaree himself served as The Sporting News cartoonist for decades and contributed to baseball products like 1947 PCL Signal Gasoline. Unfortunately, it's reported Al was robbed of significant savings near the end of his life and died without a cent to his name. May we all fare better when that time comes! Value: Even lesser-known players cost $300-400 each in low grade. Want a guy like Babe Ruth and don't have thousands to throw around? Fuggedaboutit. Fakes / reprints: It'd be difficult to pass fakes of a set this rare, but also profitable enough that someone's probably tried doing it. Caveat emptor! Bid on one of these last week. Didn't win it . Only seen a single (high-grade) #5 on eBay for $1100, quite a price point. Not sure if this one will ever come off the type list.